Terry Pratchett fans, rejoice. 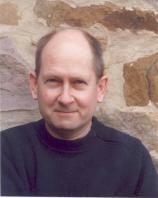 The creator of the bestselling fantasy series Discworld teamed up with science fiction writer Stephen Baxter to create the New York Times bestseller THE LONG EARTH. They are back with an inventive sequel for this scientifically informed, witty and thought-provoking new series, THE LONG WAR. Briefly, for the uninitiated or those needing an update: 25 years ago in Madison, Wisconsin, a home-grown science project involving a potato, a switch, a dial and some wires led to an unexpected outcome. A handheld device that came to be known as a “stepper” was created when its inventor turned it on, twisted the dial and found himself still in his hometown, but in the vacant lot where his future house would stand. A cheap, easily constructed, personal time machine was born. Promptly and, some might say, sadistically, he posted full assembly instructions on the Internet. Before you could say BAZINGA, people were haunting vegetable bins and Radio Shacks for the materials. When they found themselves able to travel back in time, “stepping” became the hula hoop sensation of the 21st century. "Terry Pratchett fans, rejoice. The creator of the bestselling fantasy series Discworld teamed up with science fiction writer Stephen Baxter to create the New York Times bestseller THE LONG EARTH. 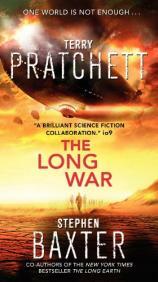 They are back with an inventive sequel for this scientifically informed, witty and thought-provoking new series, THE LONG WAR." Following the rules was the key to success; an instant version of natural selection occurred as the careless and greedy were soon eliminated by their own stupidity. Successful steppers could expect mild motion sickness, and a select few discovered they were natural steppers. Joshua Valiente, a bright young orphan and natural stepper, soon discovered that he could move great distances as well as through time. He is taken under the wing of a mysterious Tibetan priest named Lobsang who invents a space dirigible that allows movement at great speed through thousands of Earth worlds to the beginning of time. Together, Lobsang and Joshua explore the Long Earth, returning from their legendary journey with stories of the possibilities for mankind to reinvent civilization and learn from our mistakes. However, not everyone is able to step, and THE LONG EARTH ends with a bang as a mad, anti-stepping recluse blows up Madison with a nuclear backpack. Survivors step out into the vast worlds of early Planet Earth. THE LONG WAR begins 10 years after Madison. Joshua is married with a son, the mayor of a small pioneer town in one of the step-worlds and reluctantly finds himself an international hero and legend. Stepping has caught on in Europe and Asia, and international trade is booming. The world no longer has to depend on oil, vast fertile fields fill the Midwest to feed the world population, and barter for goods and technological services between far-flung step-worlds is the basis of commerce. Life is good, almost serene. Meanwhile, a migration as never before seen in history has created tens of thousands of scattered mini-towns and villages. An American center of government called Valhalla has arisen a million step-worlds away. The problems associated with starting a new world order have created political, financial and logistical problems of the predictable and not-so-predictable kind. How do you tax people to run the government? If you committed a crime in current time, can you escape punishment by stepping back a couple of centuries? Or millennia? And what do you do with all the wondrous pre-evolutionary creatures you encounter? A tipping point is reached when a family of trolls, members of a previously unknown population of early pre-human but sapient beings, are allegedly being mistreated in one of the outer regions. Trolls have been found to learn human skills at remarkable speed. They are very large, strong and friendly, and willingly serve as beasts of burden and have become essential to human commerce. They can also communicate over vast distances of time and space. And more importantly, they are good at stepping. When the trolls suddenly start to disappear, world commerce is threatened. The central Valhalla government determines that it is time to count noses, assets, skills and trends, not only of people, but of trolls. They send a team of statisticians, scientists, sociologists and law enforcement people to find and register the far-flung steppers, not just humans but possible other sapient and potentially useful beings. Joshua and some of his early companions are tapped to lead an essential part of the expedition. Let the games begin.